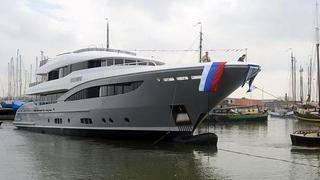 Launched in April 2013, the 39.7m motor yacht Apostrophe has now been delivered by Dutch yard Hakvoort. Her contemporary Art Deco interior, designed by Reymond Langton Design, accommodates 10 guests in five staterooms including a full-beam master suite on the main deck and two double and two twin cabins on the lower deck. Built in steel and aluminium, Apostrophe is powered by twin 500kW Caterpillar C-18 engines giving a top speed of 12.7 knots and a cruising speed of 11 knots. Her build was managed by Moran Yacht & Ship.